ElectronicKitSchool. - Android as the smartphone OS in this time also support with electronic microcontroller hardware that called with Arduino. Now, by using smartphone based on Android OS, you can control your Arduino project easily. So, there are many electronic project can develop with integrate Android system with Arduino. 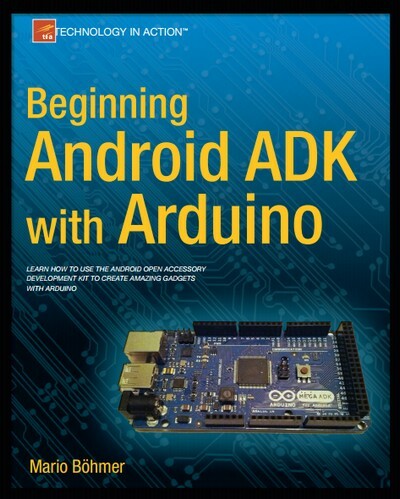 To learn more about how to begin Android Accessory Development Kit (ADK) with Arduino you can read one a good book that titled with Beginning Android ADK with Arduino (Technology in Action) 1st Edition that authored by Mario Bhmer. This article will show you the reviewing of Beginning Android ADK with Arduino (Technology in Action) 1st Edition book like book description and table content. The last in this article we also will give you link to take download e-book of Beginning Android ADK with Arduino (Technology in Action) 1st Edition freely. Mario Bhmer has written a book with the title Beginning Android ADK with Arduino (Technology in Action) 1st Edition that presented to you who want know more about how to use the Android open Accessory Development Kit (ADK) to create amazing gadgets with Arduino. In the first chapter, this book show us that In May 2011, Google held its annual developer conference, the Google IO, to present its newest technologies to approximately 5,000 attendees. In addition to improvements in its already well-known technologies such as the Google APIs or the core search technology, Google placed the focus on two major themes: Chrome and Android. As always, the newest advances in the Android Platform were presented and discussed, but what Google announced a bit later in the Android keynote was a bit of a surprise: Google’s first standard for Android devices to communicate with external hardware. The Android Open Accessory Standard and the Accessory Development Kit (ADK) will be the key for communicating with hardware and building external accessories for Android devices. To encourage development, Google handed out ADK hardware packages to interested attendees and showed some examples of ADK projects, such as a treadmill which transmitted data to a connected Android device and a huge tilt labyrinth, which could be controlled with an Android device. Shortly after the event, the first DIY projects surfaced which already showed the great potential of the ADK. Since I couldn’t attend the event, I had no chance to get my hands on one of those kits; at the time, there was only one distributor for the Google ADK boards and this distributor wasn’t prepared for such a big demand. That didn’t stop me from building an alternative myself and from experiencing the joy of this new field in Android development. Over time, many more distributors have produced derivatives of the original Google ADK boards, which are, for the most part, cheaper and only provide the basics to get you started hacking your project together. You probably just want to dive right in, but first you should learn about the specifics of the ADK and set up your development environment. You wouldn’t build a house before you knew how to do it or without having the proper tools, would you? As reviewed from Amazon describe that Whether you're new to Arduino and Android development, or you've tinkered a bit with either one, this is the book for you. Android has always been a natural fit with Arduino projects, but now that Google has released the Android Open Accessory Development Kit (the Android ADK), combining Android with Arduino to create custom gadgets has become even easier. When you read the original book of this Beginning Android ADK with Arduino (Technology in Action) 1st Edition book may be you will see the table content like below. In the last article we let you to enjoy to get this e-book of Beginning Android ADK with Arduino (Technology in Action) 1st Edition with download it freely with the link we given you below. Here, we provide you some the links to download e-book of Beginning Android ADK with Arduino (Technology in Action) 1st Edition from external server. So, if you fail to use one link or the link broken you can choose other link to download it. Please click the icon below to start downloading.